Sanitizing hundreds of square feet? 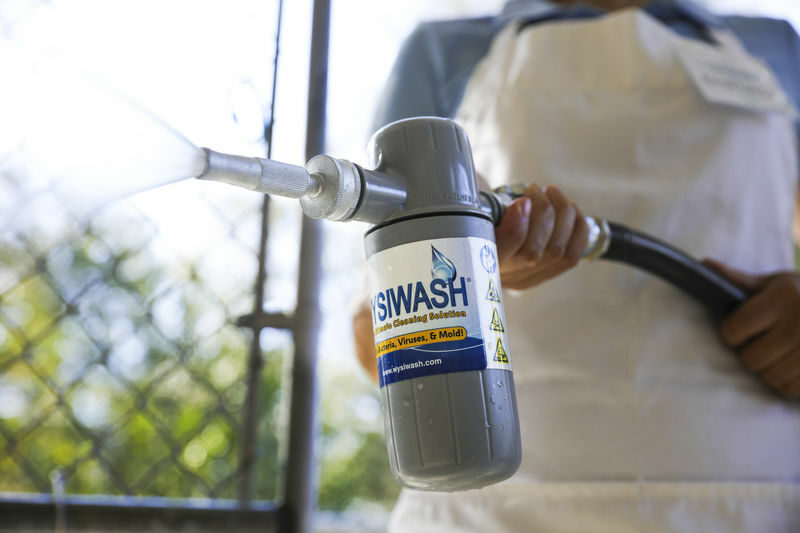 The Wysiwash Sanitizing System makes it as easy as hosing it down. 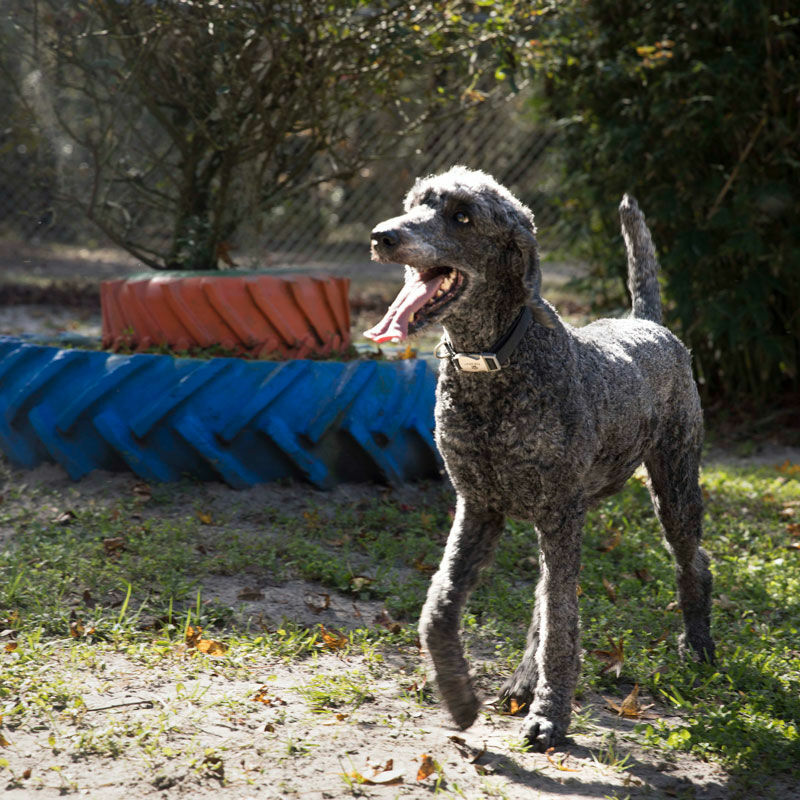 Trusted by animal care professionals for over 15 years, the Wysiwash Sanitizing System is effective against a wide range of pathogens including Canine Parvovirus, Feline Calicivirus, and Feline Panleukopenia. Scientifically designed to accurately deliver consistent levels of active chlorine, the Wysiwash Sanitizer-V sanitizes, deodorizes, and neutralizes mold/algae spores. Way more than a hose-end sprayer, it is a precisely calibrated sanitizing and disinfecting instrument. Its short contact time makes Wysiwash the kennel cleaner of choice for pet care professionals nationwide. The Wysiwash Sanitizer-V mixes and dispenses an effective, safe, sanitizing solution as you spray it. This dispensing technology allows a mild, eco-friendly sanitizing solution to be more effective than bleach or harsh disinfectants. HOW MUCH TIME CAN WYSIWASH SAVE YOU? What is your current product's contact time? How many square feet do you sanitize? SEE HOW EASY IT IS TO GET STARTED WITH WYSIWASH-WATCH OUR QUICK START TRAINING VIDEO! This product is absolutely amazing! We have been looking for a product to keep our turf clean and to take the smell away. This product is a dream come true! It works perfectly. There is zero smell! I wish we would have found it 2 years ago. The system is super easy to use and the product goes a long way. Hands down - worth every penny! No burnt paw pads here. Wysiwash's solution is non-irritating, for humans and animals. 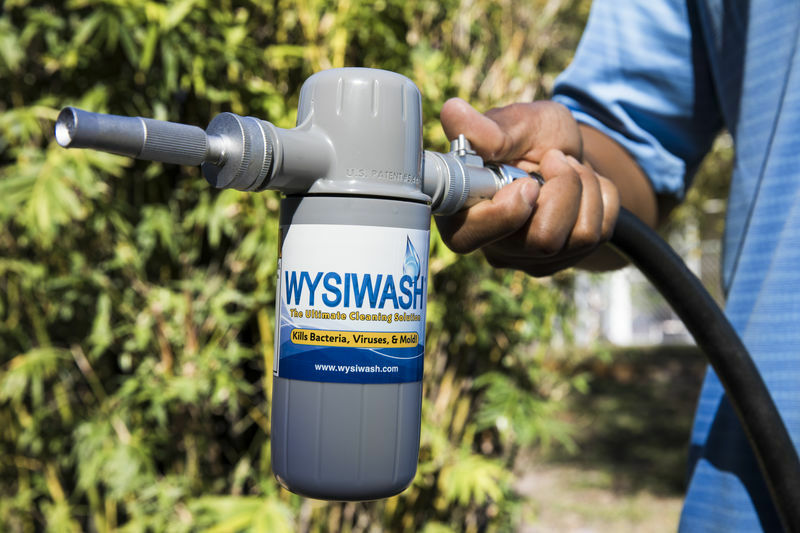 Wysiwash is biodegradable, saves water, and is plant safe- all while effectively sanitizing. Chlorine occurs naturally in soil, and is one of the most abundant chemical elements on Earth. Any organic or inorganic salt contains Chlorine. 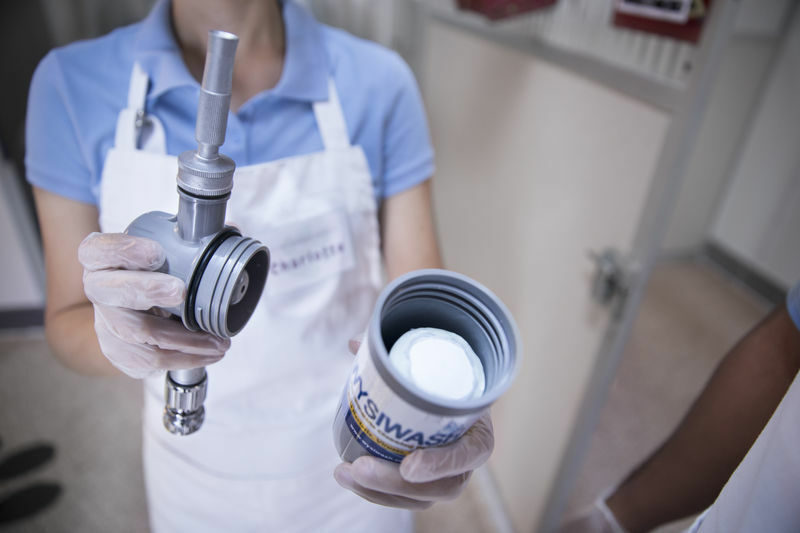 Wysiwash's main active ingredient is calcium hypochlorite (a compound made from chlorine, calcium, and oxygen). Calcium hypochlorite is commonly used in public swimming pools and to disinfect drinking water. How can Wysiwash, a sanitizer, kill parvo? Each Wysiwash Jacketed Caplet contains a highly compressed calcium hypochlorite solution which is more effective and economical to use than liquid bleach. 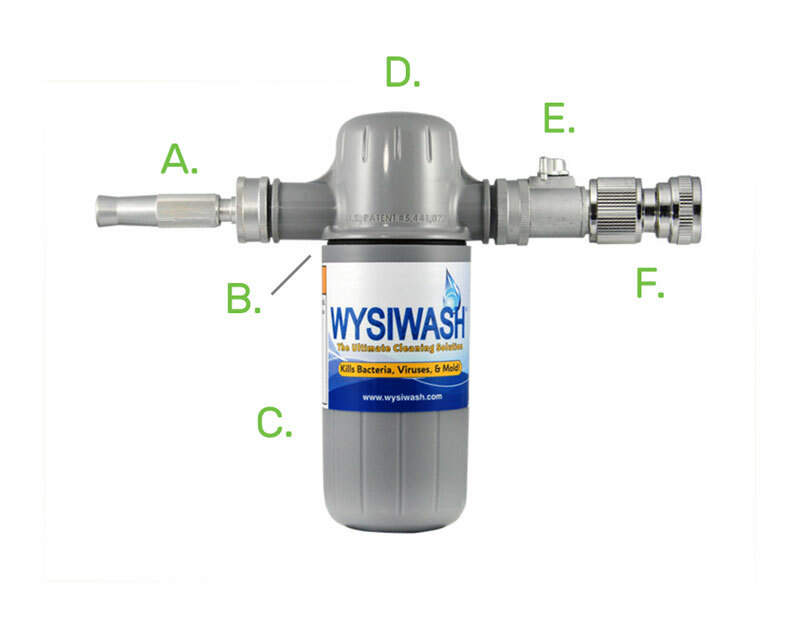 Hypochlorous acid, which is contained in chlorine, is the key sanitizing agent used in the Wysiwash Sanitizing System. Hypochlorous acid is effective against the most dangerous pathogens including bacteria, viruses, fungi (such as ringworm) and protozoa, none of which have become resistant to hypochlorous acid. With Wysiwash, sanitizing large areas is a snap. Switch today for a time saving and cost cutting sanitizing system.